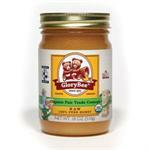 GloryBee Aunt Patty's Organic Non GMO Food Grade Coconut Oil 12 fl oz. Jack's Country Store > Food & Pantry > GloryBee Aunt Patty's Organic Coconut Oil 12 fl oz. 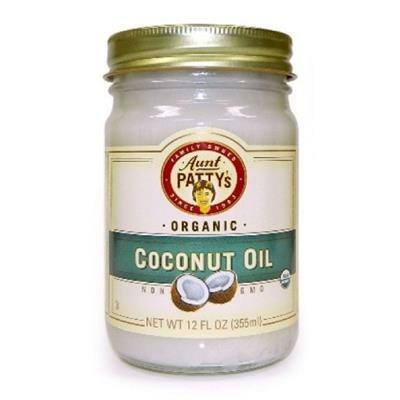 Aunt Patty's Organic Coconut Oil has a high smoke point, yet retains a neutral taste. Coconut oil is a great alternative to other cooking oils and can even be used in place of butter or shortening. Coconut oil is about 50% lauric acid, making it easier to digest and metabolize than other fats. Organic RBD Coconut Oil - RBD stands for "refined, bleached, and deodorized." RBD oil is made from copra (dried coconut kernel). The dried copra is placed in a powerful press with added heat and the oil is extracted. This oil is then refined with further heating and filtering; no chemicals or solvents are used in the extraction process. Unlike our Extra Virgin Coconut Oil, RBD Coconut Oil has no coconut taste or aroma. RBD oil is used for home cooking, commercial food processing, and cosmetic, industrial and pharmaceutical purposes. Food Grade and non-hydrogenated. Enjoy this raw, organic honey and know that you are helping to make life better for small beekeepers around the world. Beekeepers in Central and South America, and in Mexico, are able to improve their lives and contribute to their communities.